Harvest the perfect crop in this unique Hidden Object Farming Sim hybrid! Welcome to Farmington! Hope you're ready to get your hands dirty. 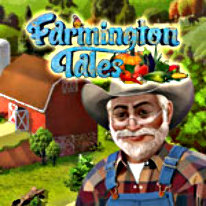 Grab that plow and let's get farming in this unique Hidden Object Farming Sim hybrid!Dahlia Farms is in trouble. The bank is planning to repossess the farm, and Floyd's only hope is winning the coveted Farmer of the Year. Time to build the best darn farm you ever laid eyes on!Grow fruits and vegetables, nurture animals, and sell the product in your very own farmer's market! Search ‘round the farm for lost treasures in places like the hay barn, the pumpkin patch, and even the cow stable. Hidden objects are randomized so no scene is ever the same twice! Complete quests for folks in town, and hang out with a quirky cast of characters. Purchase blueprints from the shop and build upgrades like a silo or a windmill! Plow your fields, plant, water, fertilize and harvest the perfect crop. You can even harvest eggs, milk, and wool!Dozens of mini-games and over 45 unique trophies to earn as you help Floyd and Dahlia save the farm!